I’ve lived in Winchester for almost 30 years and I still discover hidden gems. 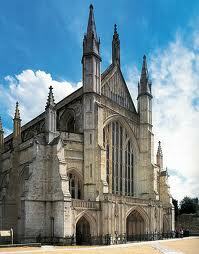 When asked, most people will know Winchester for the grand cathedral. There’s now a virtual online tour so you can see and hear about the most notable sights before taking your own real tour! Our cathedral, the scene of royal marriages – admittedly some centuries ago – and the burial place of many notables, including Jane Austen, is just a stone’s throw from the High Street. 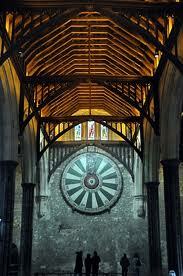 to King Arthur’s Round Table in Winchester’s Great Hall. It’s a leisurely 10 minute stroll, up the High Street and through the ancient Westgate, to the impressive Law Court complex and the Great Hall at the top of town. So why not pay Winchester a visit? The Art and Design-led market is held on the 3rd Sunday of every month so if you’re interested in original art you’ll find over 100 stalls! My favourite shops – well that’s difficult! Contemporary and every-changing displays & stock in The Hambledon, Bell Fine Arts, wonderful fabrics & yarns in C&H fabrics, Reads sewing machines with Sarah, Forme, Cornflowers, Wells Bookshop … I’m on a roll … I’ll finish with Maison Blanc – oh la la those cakes! 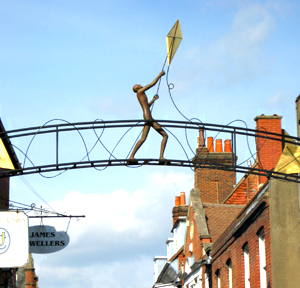 If you’re coming to stay for more than a day, you’ll find even more to explore – Wolvesey Castle, the watermeadows, City Mill, the Eastgate, St Cross Hospital – England’s oldest almshouse, Hyde Abbey and the best view of the entire city from St Giles Hill! Have fun, and let me about know your favourite part of Winchester. I’ve never been to Winchester, but maybe I should! I like the sound of the art and Design market, so that’d be the time to visit for me (although I wouldn’t see much else!). I’ve never been to Winchester, it looks beautiful. There is a statue of Saint Edmunds by Elisabeth Frink in Bury St Edmunds, which is not too far from me. I can understand why you admire her work. Put the date in your diary – don’t forget to say Hi! I love her work – this statue is amazing. You never know – I’ll be taking a trip around some Hampshire villages in the next week or so … camera in hand ‘cos the roses are just amazing atm! You are currently reading Discover Winchester … at Adaliza.